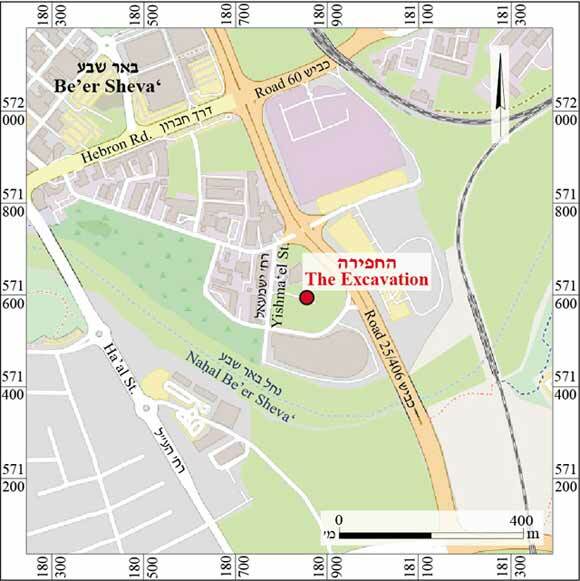 In March 2017, a salvage excavation was conducted in the parking lot of the old Bedouin market (Lot 202) in Be’er Sheva‘, on the northern bank of Nahal Be’er Sheva‘, in an area slated for the construction of a parking lot for the Cinema City complex (Permit No. A-7959; map ref. 180786-823/571529-87; Fig. 1). The excavation, on behalf of the Israel Antiquities Authority, was directed by I. Peretz (photography), with the assistance of Y. Al-‘Amor (administration), A. Hajian and M. Kahan (surveying), N. Zak and E. Belashov (plans), I. Lidsky-Reznikov (pottery drawing), A Ganor (glass conservation), C. Hersch (glass drawing), C. Amit (studio photography), Y. Gorin-Rosen (glass), S. Zamir (volunteer) and laborers. Several excavations were conducted in the area in the past. A building dating to the Iron Age was excavated east of the road to Eilat (Shimron-Vadaei 1999). Other remains from the Iron Age and part of a Roman–Byzantine bathhouse were uncovered on Ha-Melakha Street, northwest of the excavation (Permit No. A-5729). Numerous antiquities were found on this road and north of the current excavation, including a building from the Ottoman period, a well that probably predates the Ottoman period, walls from the Byzantine period and pottery vessels and a coin from the Late Roman period (Katz 2000). The remains were exposed beneath an asphalt parking lot that was paved between 1967 and 1995, west of the old Bedouin market. 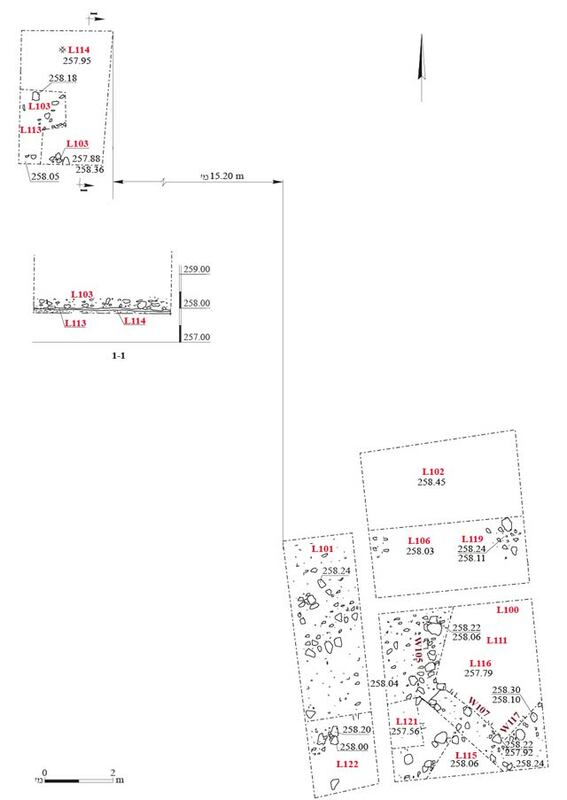 Antiquities were found in preliminary soundings at two locations (c. 150 sq m; Fig. 2). Following another probe excavated using a backhoe, four squares were opened (c. 68 sq m): three in the southeast and one in the northwest. The finds were meager and mainly dated to the Late Roman and Byzantine periods; a few were ascribed to the Chalcolithic period and the Iron Age. A layer of ash with mudbrick material (L113) on it, atop a loess floor (L114), was exposed in the northwestern square, as well as concentrations of wadi pebbles and mudbrick material, possibly the remains of a wall. The layer of ash and mudbrick material were deposited above a natural layer of wadi pebbles; they were severely damaged by a modern refuse pit (L103). The finds from the refuse pit and Layer 113 (see appendix) included a jar, probably from the Persian period (Fig. 3:3), but mainly finds from the Late Roman and Byzantine periods, including an imported ARS bowl from the Byzantine period (Fig. 3:4), a cooking pot (Fig. 3:7), Gaza jars (Fig. 3:9, 10) and a fragment of a base of a glass goblet or jug (Fig. 4:1). 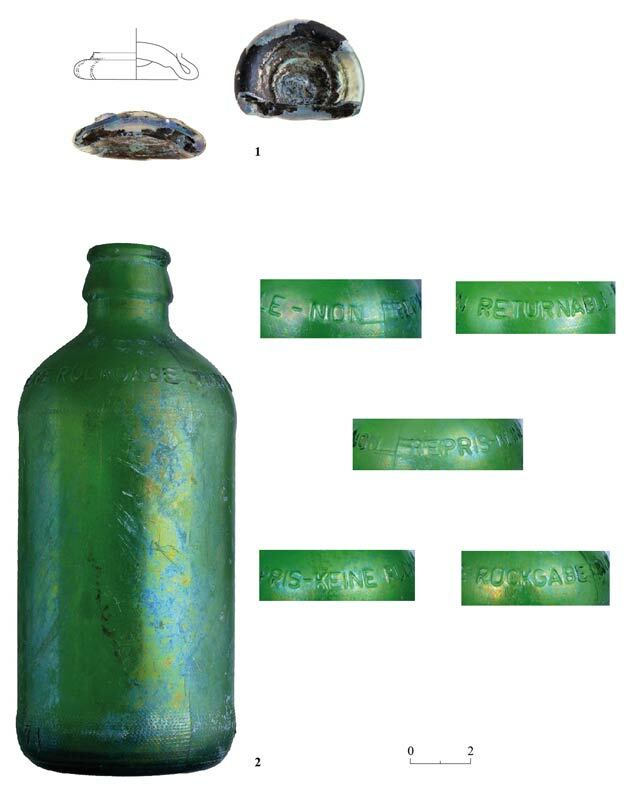 A modern glass bottle was discovered in the refuse pit (Fig. 4:2; Gorin-Rosen, below). Below the wadi pebble bedding of the asphalt in the southeastern squares were severely damaged remains that may have been the wall foundations of a building (W105, W107, W117). The original course of the walls was damaged by the burying of modern debris. The walls were built of various-sized wadi pebbles and chalk and probably, mudbricks above them. North of the walls were several medium-sized wadi pebbles (L119), perhaps the foundations of another wall of the building, which were founded on a natural layer of small wadi pebbles. The remains were badly damaged and disturbed by modern refuse pits that contained chunks of concrete, floor tiles and plastic. 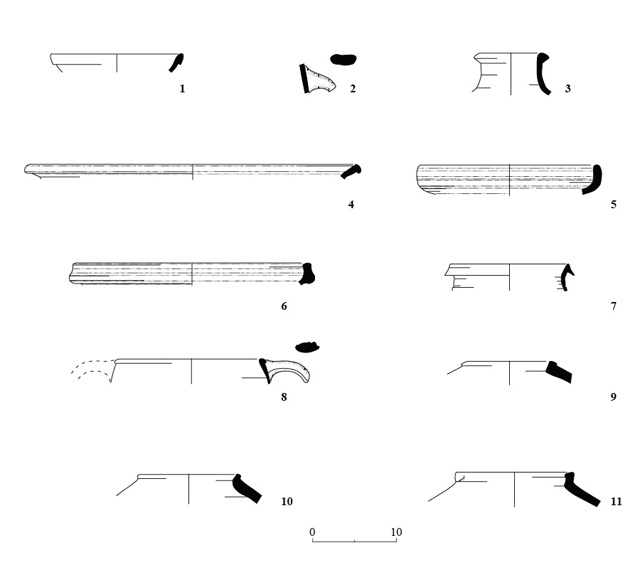 The pottery sherds found in the fills (L106, L111, L115, L116, L121, L122) included several body fragments from the Chalcolithic period (not drawn), a bowl from the late Iron Age (Fig. 3:1), a jar handle from the Iron Age(?) (Fig. 3:2) and pottery vessels from the end of the Late Roman and Byzantine periods, including LRC Ware bowls (Fig. 3:5, 6), a cooking pot (Fig. 3:8), and chiefly bag-shaped jars and Gaza jars (Fig. 3:11). Two glass items were found in the refuse pit (L103). The earlier fragment is a thickened ring base with a pushed-in center and a jagged pontil scar on its bottom (Fig. 4:1). The vessel is made of greenish-blue glass covered with silverish weathering overlain with black weathering. The base may belong to a cup or a juglet dating to the end of the Late Roman–beginning of the Byzantine periods (fourth–fifth centuries CE). An intact cylindrical bottle made of green glass (Fig. 4:2) covered with patches of iridescence and silvery weathering was also found. The bottle was mass-produced in a three-part mold: two for the body and rim and a third for the base. The connection between them left a mark along both sides of the vessel and at the point they connected to the base. On its shoulder are the words NON RETURNABLE in English, NON REPRIS in French and KEINE RUCKGABE in German; a hyphen separates the three captions. The caption, meaning ‘non-recyclable’, indicates that the bottle was used for toxic substances or for drugs. Below the caption, at the bottom of the bottle just above the base, is a roughly patterned strip with the numbers 45, 74 and a registered trademark embossed on it. A label was presumably affixed to the bottle’s body. Although the bottle was manufactured by machine, there is a circle marked on its base that is not centered, indicating an early and not very meticulous production run. Bottles written in three languages ​​are uncommon and were probably brought to Be’er Sheva‘ because of their contents. Human activity dating to the Chalcolithic period, the late Iron Age and possibly the Persian period was observed in the excavation area or its immediate vicinity while most of the activity occurred during the end of the Late Roman and the Byzantine periods. This area was likely the outskirts of the sites from these periods excavated previously to the east and the north. Katz O. 2000. Be’er Sheva‘, Ha-Melakha Street. ESI 20:127*. Shimron-Vadaei R. 1999. Be’er Sheva‘. HA-ESI 110:98*–99*.